Perfectly pink meringue, sweet raspberry curd, fresh raspberries and tart creme fraiche are a wonderful marriage of texture and flavour in these little pavlovas. I have opted to make 6 mini pavlovas, however one large pavlova would work just and well and be equally delicious. In a pan over medium heat, whisk the egg yolks a little and quickly add all the other ingredients. Keep whisking until the butter and sugar is melted, keep this mixture moving or the eggs will scramble. Cook for another 8 minutes, stirring intermittently until the curd has thickened and coats the back of a spoon. Pass the curd through a sieve to rid it of the raspberry seeds, and store in a little jar. The curd can be kept in an air tight container in the fridge for a couple of weeks. Heat the oven to 180℉. Whisk the egg whites and a teeny tiny amount of the food colouring until the whites are stiff enough that they won’t fall if the bowl is turned upside down. Gently fold in the sugars. Line a baking sheet with a silicon baking mat or a double layer of parchment paper brushed with a little oil. The meringue can either be spooned out with an ice cream scoop or piped. You want to create a little indent in the centre either way. For 6 mini pavlovas, I baked them for 1 hour, turned the heat off and left them in the oven for an additional 15- 20 minutes. A larger meringue will obviously take longer, set the timer for 1 hour 30 minutes and then check. If the tops are dry and crisp but the underneath still wet, carefully flip the meringues over, turn the oven off and leave, check every 10 -15 minutes. I like my meringues to have a little give in the centre. Remove and let cool. These can be stored in an air tight container for 2-3 days. Lightly whip the heavy cream and then stir in the creme fraiche. Set aside. I like to crack the top of my meringues before filling them. It creates a lovely little nest to house the mounds of filling. Spoon 2 tsp of the raspberry curd into the meringue nest, layer on a generous 2 tbsp of the cream, top with some fresh berries and grate on a little chocolate to garnish. Place the parchment on the baking sheet. Slice the strawberries 1/4 inch thick and lay them onto the parchment paper. Bake for 1 hr 15 minutes. Turn the strawberries over and bake for an additional 1hr 15 minutes. Remove from the oven, the smaller slices will be ready now, the larger slices may require an additional 30 minutes. The slices should not be completely dehydrated, they should still be a little tacky to the touch and soft. They will continue to cook in the shortbread dough. Dice the strawberries and set aside, there should be roughly 4 oz of strawberries now. Combine the butter and sugar until creamed together, add in the flours, and beat until just incorporated. Add in the strawberries and beat a little more. Work the dough with your hands until smooth. Press the dough into pan, push it all the way to the edges, and make sure it’s an even thickness, about 1/2 inch, you can use a smaller rolling pin or smooth glass to do this. Prick the dough all over with a fork and pop it on the centre of the lower oven rack, bake for 55 minutes. Remove from the oven and slice into 12 even fingers and sprinkle with extra sugar. When it’s cool remove from the pan and devour. My little neighborhood in Queens was buried under over two feet of snow yesterday- so I rummaged through the pantry to look for something to eat, as one does in such a situation. I like quinoa, but if it’s cooked with just water it can be pretty bland and I need some flavor in my life. Allow me show you how I like to cook it. Sauteing your peppers and onion first to get them caramelized, as well as using tomatoes with jalapenos adds a lot of flavor. Feel free to use plain tomatoes if you don’t enjoy a little heat, but you should try it, it’s really quite mild and adds a little zing! On the flip side- if you want to intensify the bite add in a 1/4 teaspoon of cayenne to the onion mix when you add the garlic. Yum! In a medium sized saucepan add the olive oil, red pepper and onion. Cover and sweat the onions for two or three minutes until the onions are translucent. Uncover and saute until veggies start to get a little bit of color, approx. five minutes. If it starts to get too dark, too quickly, turn down the heat and splash in a little stock to de-glaze the pan. While that cooks- drain the canned tomatoes, reserving the tomato liquid in a measuring jug. Top off the liquid to 1.5 cups with stock or water. **Add the minced garlic to your pan and saute for a minute more to cook the garlic slightly. Add the liquid and tomatoes to the pan, bring to a simmer. Add the quinoa, lower heat, cover and cook until tender, about 15-20 minutes. Turn off the heat. At this point you can add the optional spinach (I didn’t have any this weekend, and I’m not going to tromp through three foot snowdrifts to get some 🙂 so there aren’t any in my pictures, but I normally would add it) add the spinach to the pot and put the lid back on for two or three minutes minutes to wilt the spinach. Fluff with a fork. Salt and pepper to taste, chop up a bit of cilantro to garnish if you’re into that sort of thing- which I am. This is one of my favorite sides with a nice grilled fish or chicken, and it’s hearty enough to have as a vegetarian main on it’s own or with the addition of some grilled tofu. **note- the reason that I don’t add the garlic at the beginning is because I like to caramelize the onion and pepper to get the fullest flavor possible and minced garlic would burn and taste bitter well before any browning would happen. 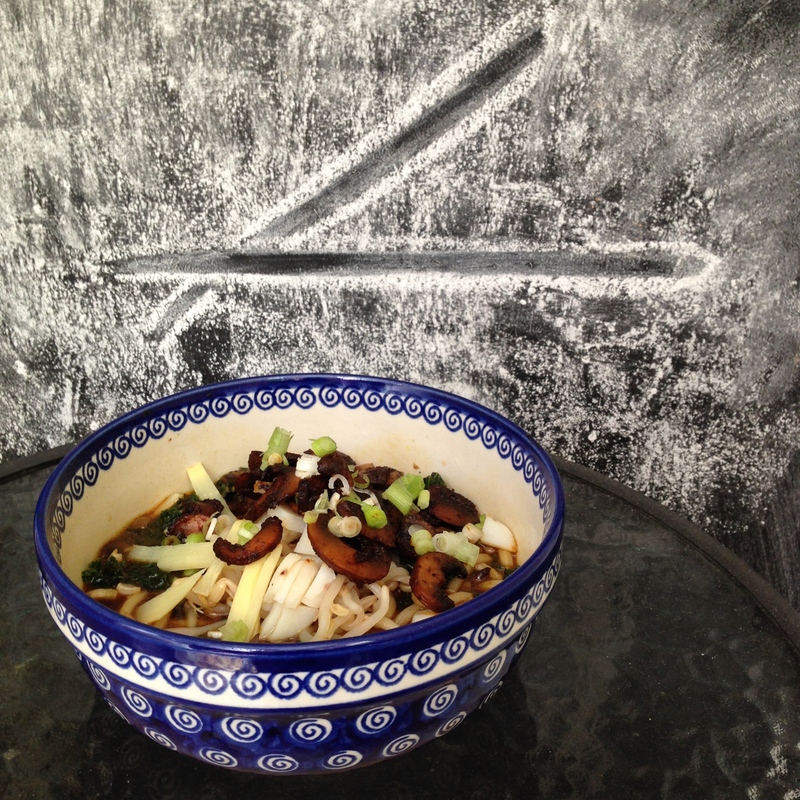 In a medium saucepan bring broth and the hoisin sauce to a simmer over low heat. Set aside. Cook the mushrooms in two batches. In a frying pan add oil and butter and the diced mushrooms, sauté over low heat until browned (approx. 5 minutes). Add to broth. In the same pan, add the remaining oil and butter and sauté the sliced mushrooms until browned (approx. 5 minutes). Add sriracha to taste, set aside. Add noodles and kale to broth, to warm through. 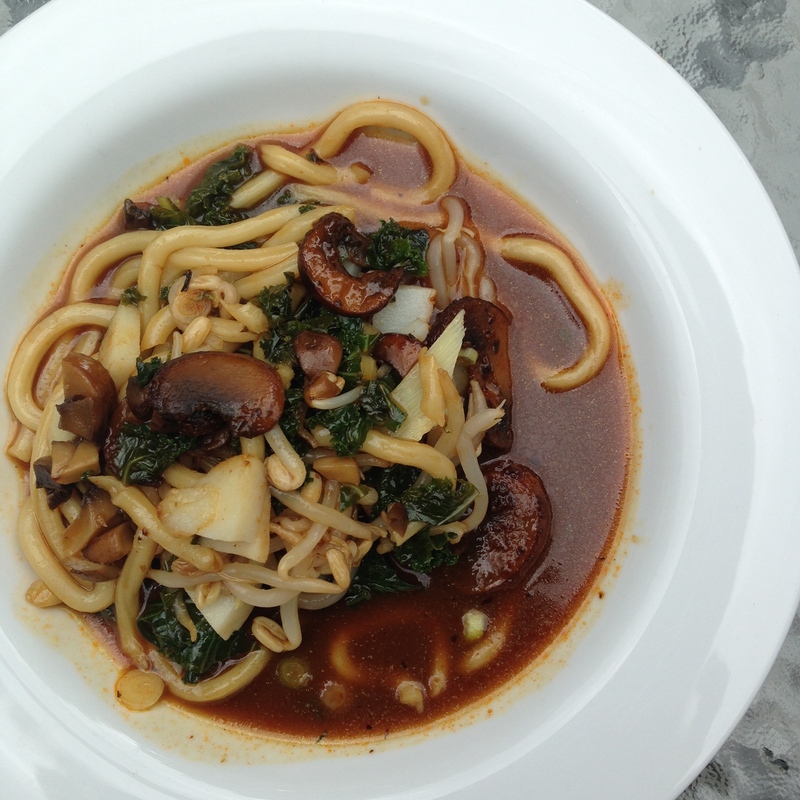 Divide the noodles, broth and kale between two bowls, place the sliced mushrooms on top and finally sprinkle with the bamboo shoots and sprouts, water chestnuts and lemongrass.